Experts have been assessing storm damage to the ancient fortifications in Old Portsmouth. The walls, built around the seafront to protect the city 200 years ago, were battered by huge waves at the weekend. There are now holes in places, with the worst damage at Long Curtain Moat. "Some of the walls around Old Portsmouth are in excess of 200 years old and they've stood up very well since October with all the storm damage. "We are in the process of looking at these structures, with the Environment Agency, for their complete refurbishment and replacement in the next few years. "We're in assessment for the actual costs, but in terms of what's laid down in our strategy we think the refurbishment programme could be in excess of £60 million throughout Portsea Island." Following concerns over increasing land movement, in the area of Undercliff Drive in Ventnor, on the Isle of Wight, people from properties in the affected area have left their homes. and been told they may never be allowed to return home. The road collapsed last week following months of heavy rain. 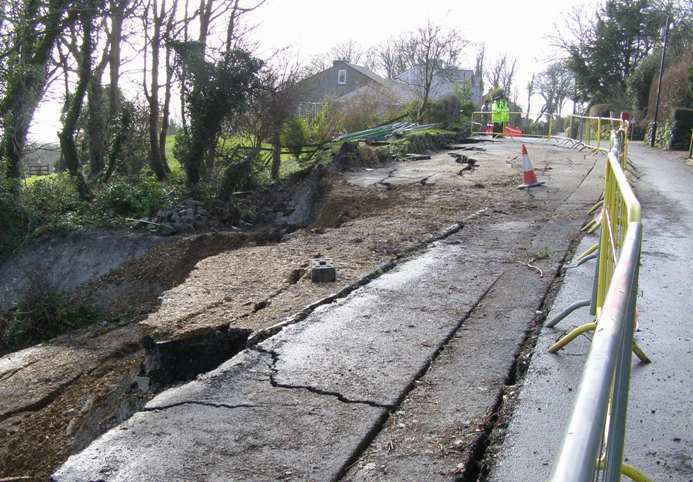 In total, nine properties are in the affected area along a stretch of Undercliff Drive between Niton and St Lawrence. Council officers accompanied by a fire officer and police officer have been advising the residents of the deteriorating situation and providing advice and support. - On site advice and help from social care and homelessness officers. - Emergency service support to assist with relocation, if required. - Help in moving belongings to a safe location for storage. - Provision of temporary hotel accommodation, if required. The council is being supported by Island Roads, Hampshire Constabulary, the Marine Coastguard Agency and members of the armed forces, who remain on the Island to assist with the operation. Access to the site is extremely difficult and is worsening. Further inspections led to the latest decision to recommend to residents to leave the remaining occupied properties on the northern side of the road. Access to the site is restricted to authorised personnel only and the location is security fenced and gated at either end. Following unauthorised incursions into the site, a strong reminder has gone out to members of the public and media not to try to gain access to the site – this is due to safety concerns because of movement in the area. A formal road and footpath closure order remains in place. The Isle of Wight Council is working with technical experts to consider the longer-term issues surrounding the stability of Undercliff Drive. It could be six months before river and water levels return to normal in counties including Hampshire, Dorset, Wiltshire and Kent. "The Tactical Control Group (TCG) for the Winchester District, led by the City Council, will remain in operation until at least early next week to deal with continuing flood-related issues and the possibility of further bad weather later this week. "Sandbags are still being provided for local communities where new flood threats emerge – the total distributed in the Winchester District via the TCG now stands at around 20,000. "Teams will be out today gully-clearing in a number of villages and starting the clean-up at Park Avenue in Winchester. "The City Council’s Environmental Health team has been in touch with Southern Water throughout the flood emergency. The advice remains that avoiding contact with sewage-contaminated flood water and good personal hygiene are the best preventative measures." In Romsey, the EA, military, emergency services and local authorities have worked to put in place a major flow diversion scheme in the River Test to protect 300 properties. Over the past two weeks, 50 demountable defences - including some imported from Sweden - have been erected to help provide protection to at-risk communities. Greatbridge Road has been reopened both ways between Yokesford Hill and Fishlake Meadows, after earlier flooding drained away. 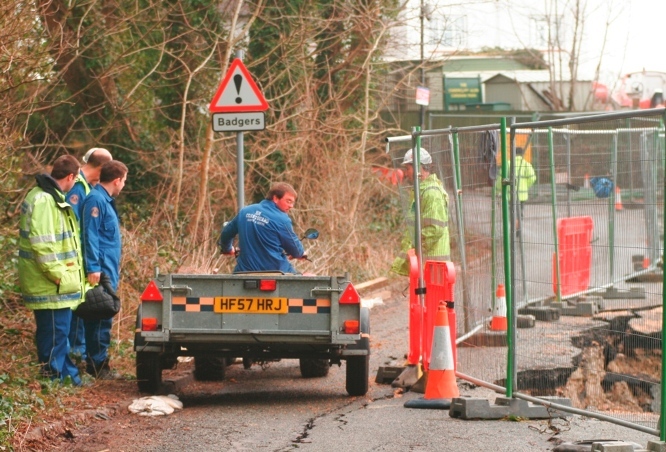 Budds Lane was partially reopened on Tuesday afternoon. 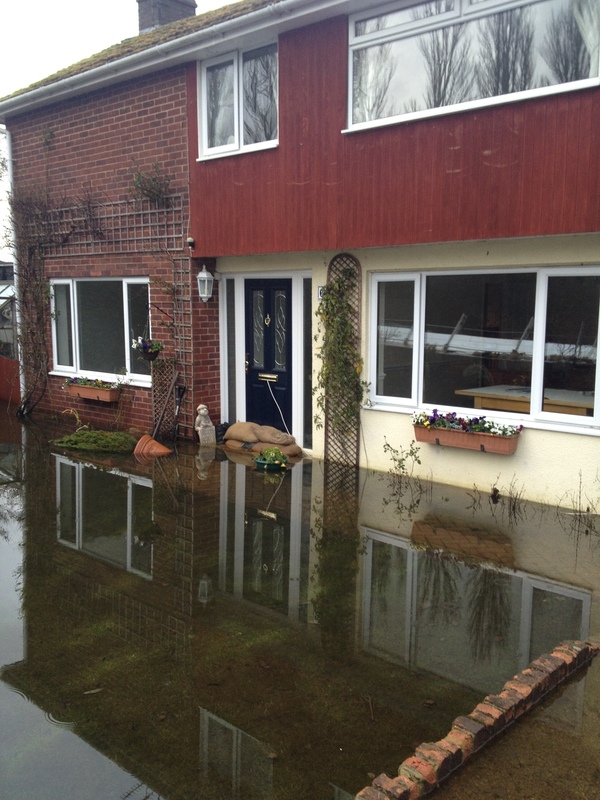 Since 29 January, 1,669 properties have flooded but 207,000 have been protected. More than 2.5 million flood warning messages have been sent by the EA. The public have also been warned about palm oil, which can be harmful to dogs, washing up on beaches along the south coast. The oil, which is formed as small white, chalky balls which smell of sulphur, have been found on Weston shore in Southampton and in Sussex. It is not known where the palm oil has come from. It is not dangerous to humans but can, if eaten, cause injury or death to pets, especially dogs. "Following the recent storms, we've had reports of palm oil being washed up on Weston shore in Southampton and across the border in Sussex. "We'd like to warn members of the public, particularly dog walkers on coastal areas, to be extra cautious and keep their dogs under control on the foreshore. Meanwhile, over the weekend (15 and 16 February), highways engineers worked on Andover Road to erect a temporary elevated carriageway to enable traffic to travel on one lane of the northbound dual carriageway and relieve the pressure on other roads going out of Winchester. “On an average day, 6,000 vehicles travel northbound on the Andover Road. Its closure has obviously led to increased traffic congestion and we were concerned that the city could become gridlocked if other routes in and out of Winchester were to become similarly affected. The solution we have come up with is the construction of a temporary elevated carriageway. This has involved using 68 concrete barriers to retain 160 tonnes of 40mm stones and a further 160 tonnes of crushed concrete, finished off with over 500 square metres of tarmacadam road surfacing.